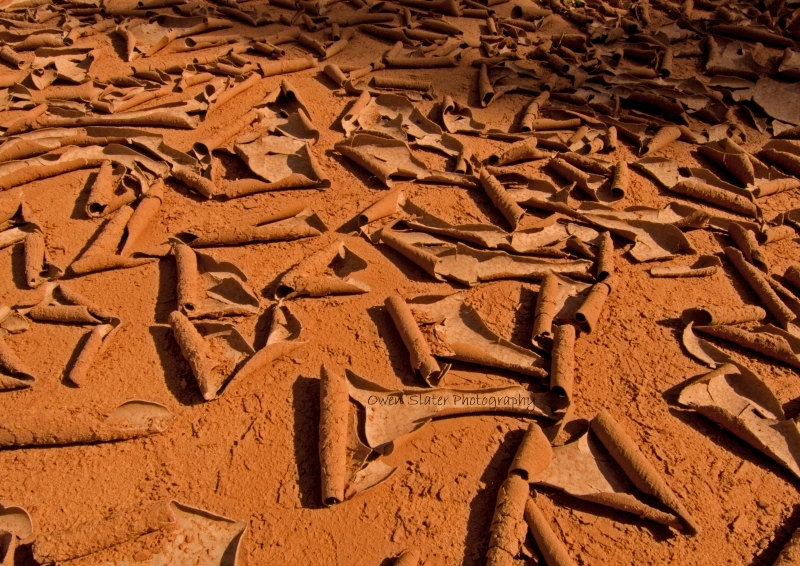 Under just the right conditions, thin layers of mud will crack and sometimes curled up into these shapes that look like tasty chocolate treats! 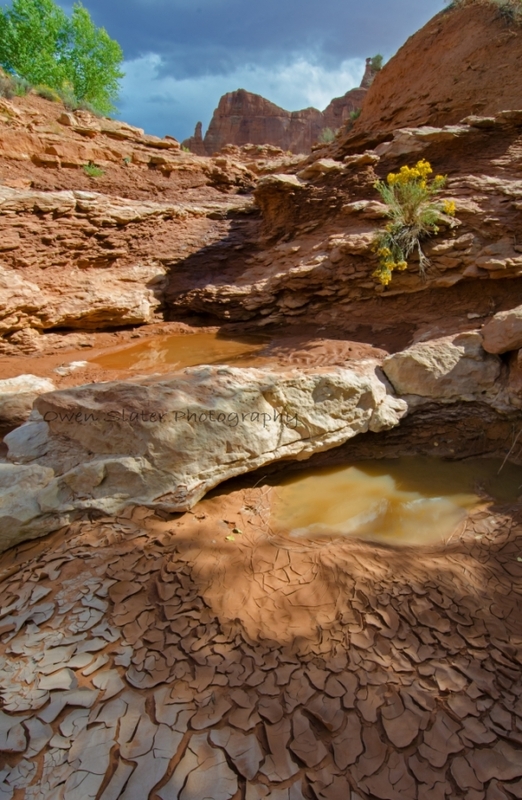 I came across these neat formations while hiking along a stream in Arches National Park. Having visited Arches National Park before, I wanted to explore some of the more remote areas on my trip in October. After a bit of a hike and a steep scramble up a sandstone formation, I came across this amazing cave with spectacular views over the valley below. The extra effort to get there was certainly well worth it. The Three Gossips is the rock formation to the left. They are overlooking the Courthouse rock formation to the right. The bright light is an oncoming car’s headlights. 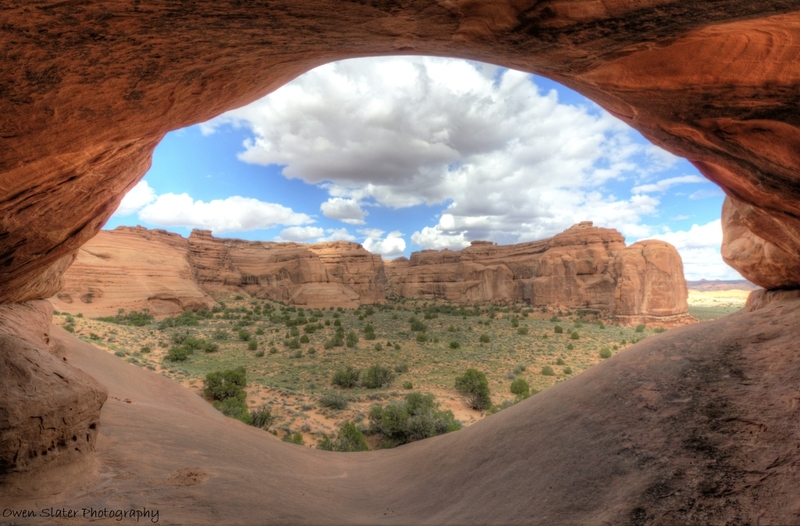 Looking back through the South Window into the valley below in Arches National Park. 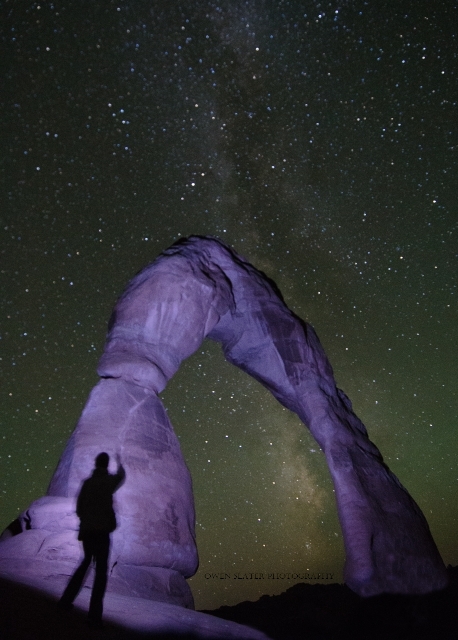 One of the most photographed arches with the “Washer Woman” rock formation in the background. To get this photo I had to wake up very early to drive from Moab to Canyonlands National Park. I had read that hordes of photographers are usually present in the morning so I wanted to make sure I was the first one there, especially seeing as I had no tripod and would have to make one when I got there. Making things more complicated was that my flashlight batteries had died so I had to use the light from the LCD display on my cell phone to make my way along the trail to the arch. I was the first to arrive so I had first choice of where to set up. I found three large branches I propped up, laced together and made a tripod with my coat on top to provide a stable surface to rest my camera on. No doubt I was laughed at by all the ‘professional’ photographers that showed up later with their Gitzo tripods. All that work and I ended up getting this picture hand holding my camera. Clouds on the horizon had initially prevented getting the orange glow on the underside of the arch but 30 minutes later (after everyone else had left) the sun was high enough to get the glow. Even better, was that clouds had come in to interrupt the blue sky making a much more interesting photo. This was one of hundreds I took that morning. For this ‘aerial’ photo I climb a rocky outcrop near Turret Arch and used the rock pathway to direct your eyes through the photo to the sun lit rock formations that include Double Arch.